A few months back, I was reading Krystal‘s blog and saw several features on San Francisco-based designers Mina + Olya. Curious, I hopped on over to their site and ended up spending a large chunk of time reading about their story and perusing the collections. Mina and Olya are two friends who left their financial consulting careers to start a fashion line, which is designed and made in the United States using organic and sustainable materials. Their focus on sustainability and supporting domestic affects nearly every part of the business, from fabrics down to the web designer and bank that they use. I recall reading somewhere that they were unsatisfied with the offerings available for the corporate woman, and wanted to create high-end options that were edgier yet still classic. I felt that the driving values behind M+O would resonate with many women who want something unique for work (and after work), while supporting a small businesses and other respectable causes. As someone who also works in financial services but enjoys fashion, I really admired M+O for taking a leap of faith to do what they’re passionate about. I wrote them a note expressing that and wishing them the best on their journey. I also mentioned that their line appears to be for a taller figure, and to please consider making petite proportions as well in the future (especially for items like their green wool dress). The ladies responded warmly and asked about my mailing address for a little holiday something. I assumed it was for a Christmas card, so imagine my surprise when a green wool dress showed up in my mailbox. As appreciative as I was of M+O’s generosity, this dress was definitely designed for someone taller than myself. I was ready to send back their kind gift, before deciding that I loved it enough to try and do the alterations myself. I figured I could at least share this brand I admire with taller readers and those based in SF, and also show shorter ladies examples of alterations needed to adjust regular-sized garments for a petite figure. One of the biggest fashion myths is that shorter women only need a hem job with regular-sized garments. As I’ve learned through experience – it’s a matter of overall proportions that involves attention not only to length, but also the waistline, bust placement, armholes, and more (ie. see lapel size alterations for this coat). For this dress, I raised the waistline, slightly adjusted the bust darts, slimmed the sleeves and armholes, and shortened the length and sleeves. Luckily, the shoulders of a size 2 were already a good fit. I love the end result, and envision this is how the dress would’ve looked off-the-rack on a taller figure. To further accentuate the waistline, I chose a banded belt that is a new addition to my collection. I’ve shared before about LXR & Co (disclosure – members receive a $25 credit for invited friends who make a purchase; use code EXPET20FAN for a $20 credit), which holds daily online sales of vintage designer items. Last year, I received a gift card for something to feature in an outfit post. Despite the tempting daily eye candy, I waited for a wishlist item to come along that I’d be just as likely to purchase with my own money. It was worth the wait, as I couldn’t believe my eyes when I saw this belt in a recent sale. I had lost an auction many moons ago for a belt in the same style and size, due to driving into a patch of land devoid of wireless reception (gotta love Western MA). I frequently wear my Hermes belts from Nick, and wanted another option with the same clean, waist-cinching style but no logo and a thicker strap. Since Hermes belts are frequently counterfeited, I had doubts of authenticity when bidding on auction sites. LXR&Co; guarantees the authenticity and stated condition of their items, so I felt more confident going through them for a piece like this. After being duped by a Celine belt knockoff recently (via eBay), I wanted to be extra sure. I asked their customer service several questions about this belt, to which an Hermes specialist provided prompt and detailed responses. Readers – If any of you have made a purchase through LXR & Co, I would love to hear about your experiences. Beautiful look and kudos on your alterations skills. The shoulder is strong but not overwhelming as others have mentioned. The style of the dress is very structured and although it's not your normal style, it's appropriate for the fabric and current weather. Adding the silk blouse and belt is perfection for the look. Great job on keeping the design element intact, including not going too short. You look elegant and beautiful Jean. i love this dress and how you maintained the design of it, while altering to fit your frame. the colour is gorgeous too! Your hair looks gorg in these photos and of course the shoes are quite fab! If you like M+O, check out Dobbin (dobbinclothing.com)! I received the black Juliet ponte dress from Dobbin for Christmas, and I've worn it once a week since. Love it! Gorgeous dress! It looks great after alterations. I love how you layered a collared shirt underneath; really makes the outfit a bit more edgy. I agree with M&O;'s assessment that there is a dearth of edgy/trendy but still appropriate workwear out there! I'm 5' 85lb-ish. I've analyzed clothing proportions to death in my experience with sewing and alterations. 1. The thickness of fabric means to emulate the proportionally slim look on a tall figure, it would need to hug the petite figure more, unless bone structure of figure is super super thin. 2. Shoulders are a smidgen too wide and too bulky (fabric). 3. Armscye (arm hole) could be higher and it makes a huge difference. Tapered sleeves shortens the arms visually. 4. The waist line doesn't align with natural waist and has been altered too short, particularly in the front, giving the skirt a hanging-off-the-belly look. The back of the skirt, I would suspect it to be billowy and loose. 5. The tulip shaped hip of skirt is too wide, hence the extra room in the abdomen area. Since there aren't any side seams to the skirt, alteration could've been made on the skirt mid-front and back seams. 6. The circumference of skirt opening at legs is too wide, even though the length right below the knee should be slimming. The extra billowy fabric on the bottom loses the slimming effect overall. Nevertheless, post-alteration is a dramatic improvement on the former fit! 1. I'm not sure why you seem to think Jean or any of us care about your self righteous worthless evaluations. 2. Jean has pointed out many times she is not a master seamstress. Save your obnoxious criticisms for someone who cares. Seconded. I'd love a hair and makeup routine post. You look so great in that dress! I love it! It's so chic and modern *__* Did you happen to document your alterations on it? Wow. I'm not sure her comment warrants such reply. Jean isn't afraid to experiment with different styles and I applaud her for it, but obviously from time to time, there would be outfits that some simply love and others don't. I think the original design tried to do too much, with the neckline, longer hem and sleeves and the tulip shape. The look however, had grown on me, because she styled it well and it looks perfect with the coat on. I actually appreciate Sewer Anon from above who clearly articulated why the dress might feel sort of off to some. However, I am also the Anon from above who defended the longer length. It helps to read comments from those with experience in sewing. Initially, i thought the higher waist was a brilliant idea, because it makes Jean;s legs look so long in proportion to the rest of her body. It is really nice to hear feedback from someone who sews. Especially the point on tapering the arms. This just helps me even further in taking a discerning eye to garments i already own or am considering. All of the feedback is good. I still do stand by my statement that this has been my favorite of all of Jeans posts to date, and i think it is such a sophisticated work look. Your alterations on this dress are amazing! I love the color and the final fit. The wooden detail on the heels is so chic too. Love the color of the dress! The coat really enhances the whole outfit. You're so talented! Amazing alterations as usual, Jean! I love how little touches make such a dramatic difference to the fit of a dress 🙂 Sounds like such a great company too! Glad to see that the Goyard is getting some love again. I did buy a pair of Chanel earrings (thanks to the $20 off code) but ended up returning them as I didn't like them as much in person. Their customer service was prompt and courteous, which I very much appreciated! You never cease to amaze me with the alterations you can do! Love the luxurious color and texture of the wool! Anon who commented with sewing/fitting dissection here. Unless I'm blind, I don't see anywhere in my post "criticizing" Jean's outfit. The points I enumerated are merely from a fit perspective only, and in particular to IF and HOW a particular aspect of the dress may not be comparable to the INTENDED fit on a regular sized individual. I also made no claim on my superiority, just my experience searching for and altering clothes to fit my small frame. Last, but not least, to the ANON who mockingly criticized my post, there is no indication from Jean's post that this dress is the result of her own alterations. Heavy weight wool + lining = complex project akin to her Burberry coat alteration that was wisely left to PROFESSIONAL seamstresses. So on the contrary, your post is the presumptuous one. And FYI, this is a public blog with a public comments forum. Who are you to moderate??? My comment is directed to those who are curious about petite fit. And no I couldn't care less if it is less welcomed by the likes of you. The comments section here is left open for reasons of transparency and preferably not for readers to bicker with one another. Like Steffi said, this is my personal style and there will always be looks that some like and others don't care for. Sewer anon – This was a self-alterations attempt and that was mentioned several times in this post. Like you noted, heavy wool and lining is complex and there were of course areas I could not perfect as an amateur. Mocking anon – I appreciate your intentions, but please no need to be rude. I know, I really want to get those gorgeous waves! love the sophisticated look. props for doing all the alterations! it should be a keeper! You're just SO GOOD at what you do, it doesn't cease to amaze me !! How I wish I knew how to sew like you do ! Hi Jean. I love the story behind M+O. So inspiring! 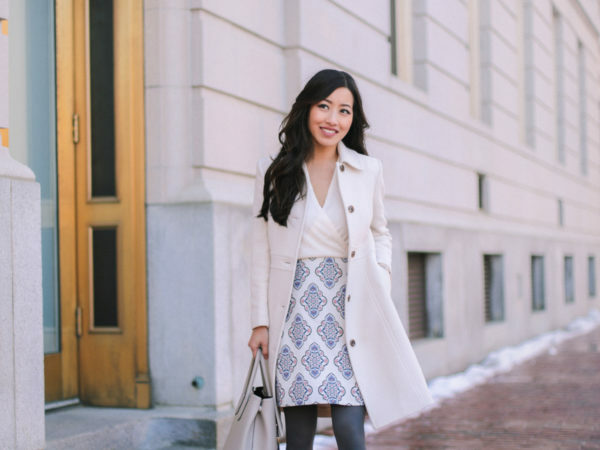 The dress is so classic and chic… it's def a good investment piece to have living in Boston with those cold winter months! The swiss dot tights are such a great touch with that outfit! Rosie – thank you for letting me know! This look is so chic and sophisticated, love it! I love your hair! Can you wrote a post on how to to make that look? Thanks! I've never purchased from LXR & Co but I will have to check them out now. And I absolutely love how that dress turned out! actually amusing that you now have some sewing experts arguing over your blog! It is a compliment in a way since it takes things to a new level. The hip roll on the dress is tough for a petite figure (like a large print or a voluminous swing skirt) but it would be tough for some other figures too. It looks nice. It does make me think about lines where the petite version of something is different- 3/4 instead of long sleeves, or a flare instead of a pleated skirt. Sometimes that annoys me but other times I think it is just smarter. Not sure if this dress "totally designed for a petite from square one" would have moved the hip feature a smidgen or adjusted the neckline a bit. Um, I wish I knew half as much about how to sew as you do. Ridic! I think it's an amazing look and if you need to look particularly polished, this is the way to go. Brava! Ha! We were in the same class with Olya for several years back in Russia – and now I'm seeing her creation on my favorite blogger! It's a small, petite world indeed! Absolutely beautiful, elegant look.